The downward flux of particulate matter from the upper part of the water column has a profound effect on ocean biogeochemistry and hence on the global climate (Fasham et al., 2001). As the material sinks it is subject to remineralisation from biological activity and dissolution dependent on its chemical composition. With increasing depth, the chemical components become more and more isolated from the atmosphere and while export from the seasonal upper mixed layer (typically 40–200m deep) removes this material for up to several months, export below the winter mixed layer (typically 400–800m) may isolate it from the upper ocean for decades or centuries. In the lower part of the water column (>1000m) long-term moored sediment traps have shown that there are strong regional variations in magnitude and seasonal variation in downward particle flux, controlled to a large extent by upper ocean biogeochemistry and plankton community structure (Boyd and Newton, 1995; Lampitt and Antia, 1997; Francois et al., 2002). 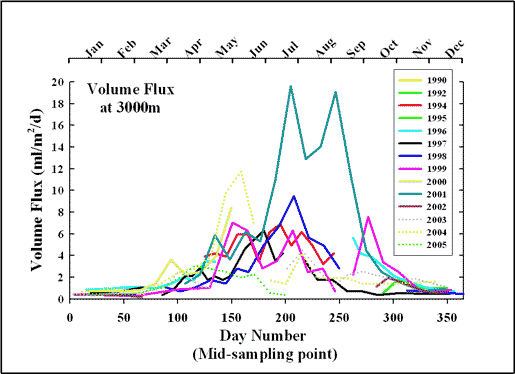 Downward particle flux has been measured at PAP at depths of 1000, 3000 and 4700m since 1989 using McLane sediment traps and this has shown that there is a strong seasonal signal as well as significant interannual variations both in the timing and magnitude of the flux.